Preheat oven to 350 degrees. Line a 12 cup muffin pan with paper cupcake liners. In a large bowl combine cocoa powder, 1 cup sucanat or turbinado, flour, salt, and baking soda. In a medium bowl whisk together sour cream, ⅓ cup milk, oil, vanilla, and whole egg. Make a well in the center of the dry ingredients and pour in wet ingredients. Mix until just combined. Add egg whites to the mixing bowl of a stand mixer. Whip egg whites until foamy. Gradually add remaining ¼ cup sucanat to whites. Continue whipping until medium stiff peaks form. Fold whites in thirds into cake batter with a rubber spatula. Fill each of the 12 cupcake liners ¾ full with batter. Tap pan on counter and put into oven. Bake for 40 minutes or until toothpick inserted into center of cupcake comes out clean. 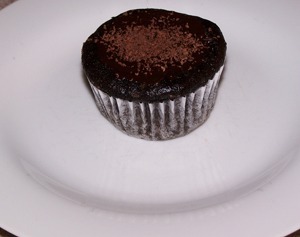 When cupcakes have completely cooled, combine chocolate and remaining 2 tsp. milk in a bowl and microwave on 50% power for 30 seconds. Stir until melted chocolate is completely smooth. Spread a thin layer on top of each cupcake. Sprinkle with additional shaved chocolate if desired.